NVIDIA just announced the Pick Your Path gaming bundle and now AMD follows with a new Civilization: Beyond Earth promotion. The offer is valid to purchasers of AMD's Radeon R9 290, 290X and 295X2 graphics cards, you can find the details over here. As always, be sure to check the terms as this offer is only valid if you purchase from a participating reseller. 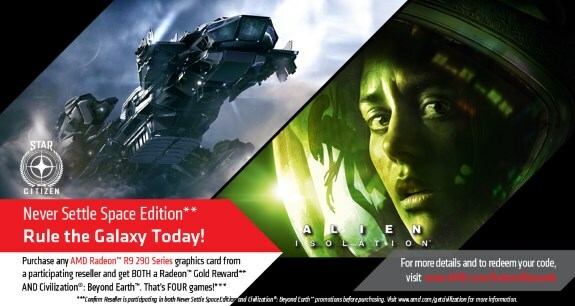 This new offer is cumulative with Never Settle Space Edition, which includes Star Citizen and Alien: Isolation, so you get four games when you purchase one of these high-end cards from AMD. The future of humanity faces uncertainty - shape your colony’s future while navigating through a new world order with the ultimate advantage: AMD Radeon™ graphics.